“Unity is strength, division is weakness” goes a Swahili proverb and Mba Ngoka self Help group which is located in Thavu village, Thavu sub- location, Kathonzweni location, Kathonzweni district, Makueni County in Kenya lives by this proverb. Brought together by a common challenge that was water scarcity they formed their self help group with an aim of joining hands and working together to improve their water security. With support from Africa Sand Dam Foundation in partnership with The Water Project, this self-help group has been able to construct one sand dam and a shallow well which have now become their main sources of water for both domestic use and for their livestock. They have been able to grow vegetables and make bricks which have greatly improved their income. 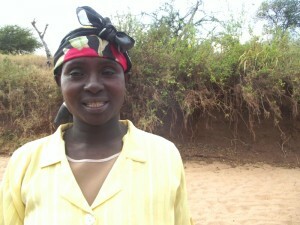 “Water brings all the good things in life” says thirty five (35) year old Esther Salimu. Esther is a mother of five, two aged 18 and above and three aged 17, 15 and 12. Her life and those of her children will never be the same again thanks to the sand dam and a shallow well which is less than 30 minutes walk from her home. She no longer has to wake up at midnight to go and fetch water in order to avoid long queues in the morning. “…In the past we used to go to the river to collect water. At midnight, when everybody was asleep, we would carry our jerricans only to hide them in a nearby bush and carry one jerrican back home. We would come back for the rest (of the jerrycans) in the morning using a donkey or a hand cart. That has changed after constructing our first sand dam; we no longer go to the river at night because water is readily available… our livestock drink from the sand dam and we have plenty of water for brick making, construction, domestic use, watering trees seedlings and vegetable farming. There are no queues anymore and fetching water has become an easy task… We can collect more than ten 20 litre jerricans of water from the shallow well. In the past during the dry season when water would be scarce, we could only fetch one jerrican for cooking and drinking thus lowering our personal hygiene. ”, said Esther. 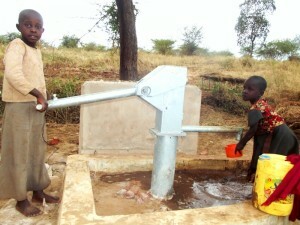 “…My childrens’ lives will change because they will not have water scarcity. Unlike me, they will be able to do home chores with ease because with water all chores are easier done. Water is everything; for instance you may have food but if you lack water you will not be able to cook It.”, added Esther. Through noble initiatives such as sand dams and shallow wells, we will create water security for the rural communities in a cost effective way and a sustainable manner. See how our implementing partners are transforming the landscape in Kenya. When you invest in The Water Project, you're investing in people like Esther. Your gifts help us reach more communities with the gift of clean, safe water. And every drop helps unlock potential.